Mmm�nothing like a little hint of cinnamon to start the morning off right! 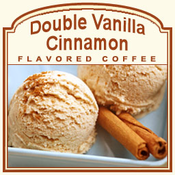 With this delicious Double Vanilla Cinnamon flavored coffee, your early morning cup of coffee will add a decadence of flavor to your busy routine, giving you a sweet moment to slow down and enjoy the morning. With a rich, pure, and delicate aroma, and the creamy, smooth, vanilla wholesomeness of this coffee, you will feel like you�re drifting away on a cloud of perfection. To top it off, the generous hint of cinnamon will warm you up. If you love spicy hints of cinnamon, the vanilla and cinnamon will work together to create the ultimate cup of coffee. Made with 100% Arabica beans, this Double Vanilla Cinnamon flavored coffee will leave your taste buds satisfied and a smile on your face. The flavor is truly one-of-a-kind � delicious, and we believe its best brewed as fresh as possible. Roasted and shipped on the same day, this coffee will be of the highest quality and freshness.